Our Snappy Toddler Top Free pattern also works wonderfully as a Snappy Toddler Dress! I used the pattern I printed out yesterday to make another version of the OG Snappy Toddler Top; a Snappy Toddler Dress! This time I went dress length and used contrasting fabric for the neck and the bias tape trim. Is this fabric to die for or what? It’s Monaluna for Birch Fabrics Circa 50 line in Starburst Pool (neckline and bias tape trim) and Chairs Multi (dress body) designed by our very own Cynthia of Fabricworm. Working with it was amazing – the texture is so lovely, probaby because it’s 100% organic cotton. 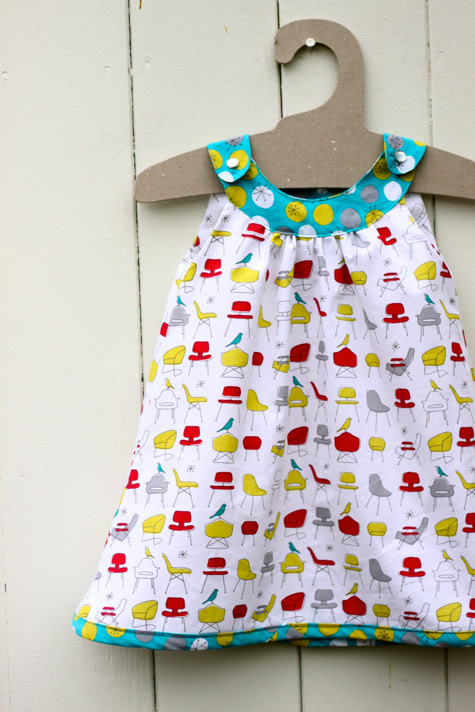 Get the Snappy Toddler Top (or dress) Pattern here and learn How to Make Bias Tape here. When you’re done, check out 25 Dress Tutorials for Babies & Toddlers (all free!). I love your fabric choices! So cute! What toddler doesn't LOVE midcentury chairs? Hendrix's first word was "Eames." Honestly I love it though. that is darling! love the contrast of the fabrics. Darling! The fabrics are so charming. I just love baby clothes in modern "adult" fabrics! What a fun dress! The fabric is awesome! I like the snappy top as a dress. Gorgeous! Love the two prints together and how it makes the turquoise birdies pop! I just used your pattern to make one of these yesterday for my little girl…so cute! Thank you for sharing! I have also been adapting the shirt pattern into a dress. In fact, except for the first time, all others have been dress length. I love it!!! You're killing me with the awesome bias tapes! I really don't need the maker, but I want one bad now 🙂 Love the chair fabric, too. Jealous. I love this! Cute fabric choice! awesome dress – but oilcloth?? whew – that stuff is awesome! Damn- are you trying to get me to get knocked up again so I have a girl? Really adorable! I love this pattern….my only problem is, will I make a top or a dress. Problem solved….I'll just have to make both. Thanks for the inspiration!!! I love the way these bright little dresses look on my little girl in the summertime! I may have to make this adorable piece even though I don't have a baby girl! Great for getting an early start on holiday gifts. I so want a wee girl so I can make this for her! The fabrics are so cute! Please, PLEASE tell me that your daughter is going to wear this to a "Mad Men" party on Sunday!! love your patterns! any chance you'll be doing a tutorial on drafting your own patterns any time soon? I could really use some advice! LOVE, Love, love that chair fabric. I need some. Such a cute dress pattern but my little girl is now a BIG girl :(. LOVE!!! I need to pull my machine out!! How should i resize this to fit my daughter who wears size 3-6 mos? Could you use satin? Normally I only use cotton, but I need to make my daughter a summer flower girl dress and this would be just adorable in the matching satin the ladies are wearing, and add hand made organza flowers to the neckline or make a sash out of a different color. All of your fantastic patterns have so many more uses, I LOVE them! Thank you! Love this dress! I can't wait to whip one up – well hopefully it will be "whipped up" 🙂 Very very cute! o how I love– now to wait to see if this baby is girl or boy– only a few more days till DD– we shall seeee!! thank u! i love this pattern… i made some dresses for my daughter and their babygirl-friends!!! so cute. THANK U! I love this dress and have some fab Day of the Dead fabric to make a cute Hallowe'en dress for my two and a half year old… BUT am I missing the tutorial for how to put it together somewhere? I'm not a great seamstress, so I need some help, please! LOVE LOVE LOVE MOD baby style! I’ve made this yesterday, my first project made from a pattern! Thank you so much for sharing, it looks darling. I very much appreciate the tutorials with printable patterns, they make life easy for a beginner sewer. Hello! Thank you for sharing this pattern! I write from Italy and so I apologize for my English. I tried to make the dress for my daughter who is 8 months old. I think it was wrong to download the format of the model because I had a little ‘small. However, I have given up and try again soon. Thank you so much, Katy. I always feel funny posting comments on posts from like, 2 years ago, but thank you for the pattern! I am soooo excited to make this for my baby girl! Looks perfect for summer! Thanks! This fabric is so unique! It makes you happy just looking at it! i just used this pattern to make the cutest dress for my little one… found a bargain fabric store and it was the best $7 i ever spent! Hey! Loved the tutorial and made this for my little girl… changed it up a bit and used two layers to make a blue and white sunday-and-visiting-grandma dress 😉 Thanks a bunch! Just wanted to double check and make sure it’s okay to have this pinned on Pinterest! If it’s not, please let me know and I will remove it ASAP! My first piece I made from Pinterest for my grand daughter. In truth this was an incredible indepth write-up nonetheless as with most excellent writers there are several items that might be proved helpful on. However never ever the significantly less it was stimulating. This is really darling! My granddaughter it too young this year, but she’ll by turning one the middle of next summer, so I will bookmark it until! I loved this pattern. This was the first thing I made for my daughter, and it came out so nice! I wanted to make another one for my niece who is a six 7, but when I print out the pattern without scaling it at an increased percentage, it only prints one page of the scaled up size. I can’t get the whole pattern printed, only one page of it. Has anyone dealt with this? Any solutions? Thanks in advance! Like sooooo many others, I can’t tile the pattern on my mac. Do not have access to windows. PLEASE help with this! !